Healthcare has gone mobile. Providers are using mobile devices like never before. With the majority of physicians using their personal devices as part of their delivery of patient care, how can they be sure their patients’ protected health information stays secure? Mobile data security and HIPAA compliance have become two of the biggest concerns among health IT professionals. Mobile devices must be defended to keep the data on them from being accessed in the event of theft or loss, but security, alone, is not enough. 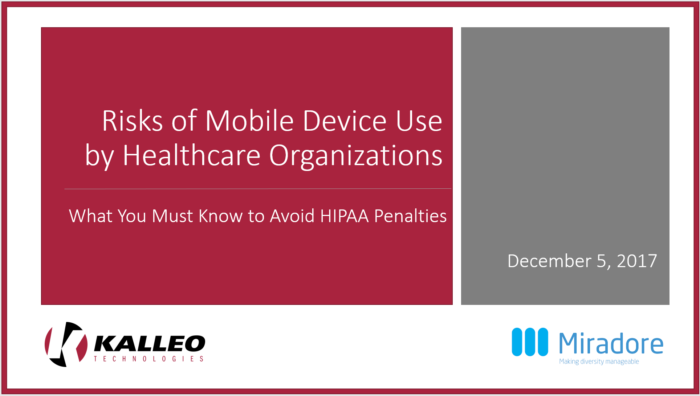 There is considerable potential for mobile device users to violate HIPAA rules and company policies. These devices are also a target for cybercriminals who view them as an easy entry point into healthcare networks.